You may have seen the HomeGround Real Estate ads which showcase how “We manage your property, you make a difference” by listing with a not-for-profit real estate agency. HomeGround Real Estate was recently selected for Yarra Trams Community Partnerships Program along with seven other community organisations championing diversity and inclusion in Melbourne. The program provides a share of $1 million in free advertising to not-for-profit organisations that promote diversity, inclusion and make a positive impact. The tram face advertising has been seen on the Yarra Trams system since May and will coincide with Homelessness Week August 6 – 12. How does HomeGround Real Estate Make a Difference for Victorians? More than 116,000 Australians experience homelessness on any given night so providing solutions to connect people with more affordable housing is paramount. 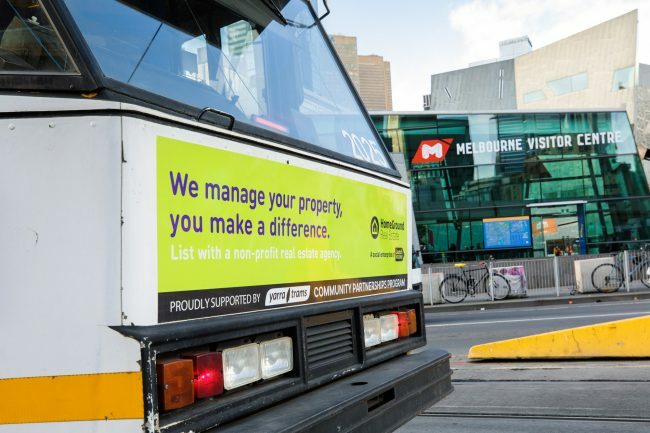 HomeGround Real Estate works closely with our partners such as Yarra Trams to build strong relationships with community organisations and assist individuals with affordable housing. As a social enterprise operated by Launch Housing, HomeGround Real Estate provides landlords and tenants with professional property management services. The property management fees landlords pay are then invested back into Launch Housing’s affordable housing solutions. For lower income earners the lack of affordable housing can lead to stress with the pressure of unsustainable rental payments and the uncertainty of temporary living arrangements. That’s why HomeGround Real Estate also gives socially conscious landlords the opportunity to offer a discount on the market rent to low income households while receiving professional property management services. Even a 10% discount on market rent can make a big difference to a person or household on a low income by creating more affordable housing in Melbourne. HomeGround Real Estate works closely with tenants and landlords to ensure a successful tenancy for both parties. Plus, for HomeGround Real Estate landlords who have listed property at a discounted rental rate the Australian Tax Office has made a class ruling to let them claim the gap as a tax deduction at the end of financial year. HomeGround Real Estate Landlord Philip Endersbee says, “It’s an opportunity for those fortunate enough to be property owners to be part of something bigger, something which can change lives and have a lasting impact”. Have a property? Contact HomeGround Real Estate to find out more call 9288 9800 or email realestate@homeground.org.au.